What will you do when your bug out route is two feet deep in snow? 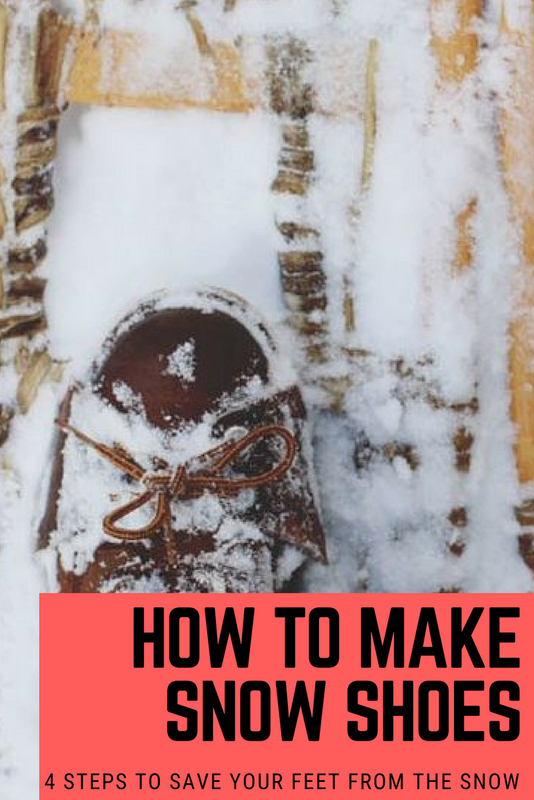 Being able to make snowshoes in the wild is a skill that you may not ever need but should have. This lost way of surviving in extreme weather can protect you when SHTF or any other winter catastrophe. If you'd like to buy your own these chinook's aren't that expensive...just saying. 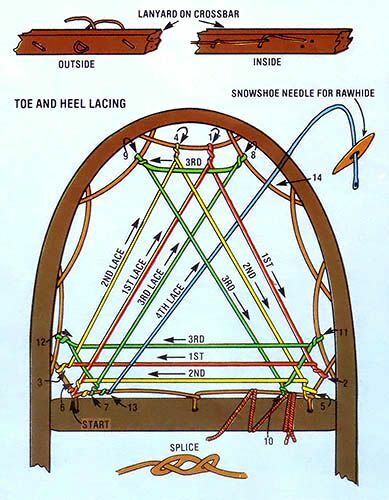 Snowshoes are a Native American invention. Europeans developed skies instead. A snowshoe works by spreading out your body weight over a larger surface. Instead of sinking to your knees, you'll simply float over the surface of the snow. While surviving in any sort of situation is much easier if you have the right equipment and supplies with you, it’s even more important in winter. There are regional differences that evolved to best serve the local terrain. Dry snow and open plains gave us long narrow snowshoes. In terrain with a lot of undergrowth and deep drifts people made short round snowshoes. Different snow types also call for different styles. The dry and deep snow of midwinter is best tamed with a tightly woven mesh and huge frame. Early and late winter snows are wetter. You'll want a snowshoe that has a coarser weave with a shorter frame. Game hunters often carry two pair. A longer thinner pair lets you walk faster on the trail. But they are useless in the brush. Smart hunters carry a smaller round set for tramping to the hunt site. The longer set can be left trail-side or tucked in your pack. 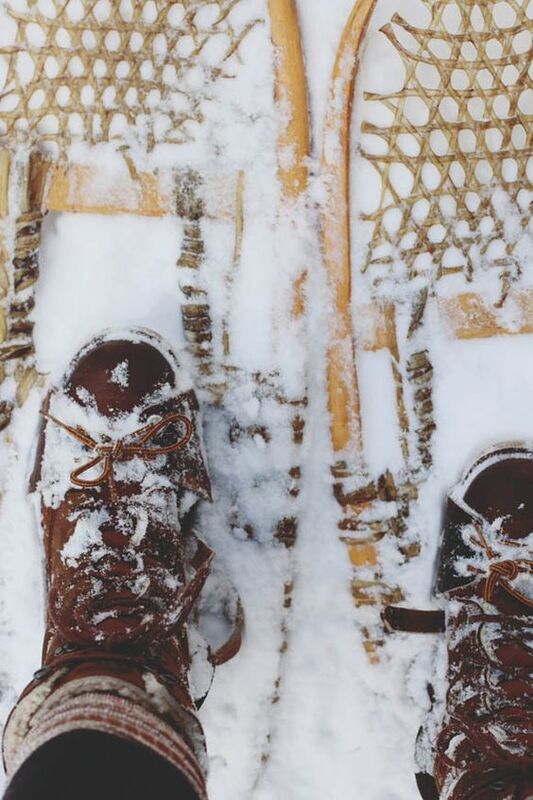 Traditional snowshoes are made of straight grain ash. It is carefully carved and then bent into shape. Next the craftsmen would weave rawhide strips around the wood to form the mesh. Around the toe and heel the mesh is tighter. A gap is left under the foot for safer walking. The snowshoe is pretty easy to walk in, if you get the right pair. Pick one that lets you walk about normally if you stretch your stride. Using too wide shoes for too long can do a number on your hip and knee joints. You want to avoid shoes that overlap when you walk. The foot binding holds the toe of the foot tightly to the shoe. The heel is allowed to lift freely. Traditional tied bindings let you take your shoe off with a twist of the ankle. Modern bindings are removed by hand. 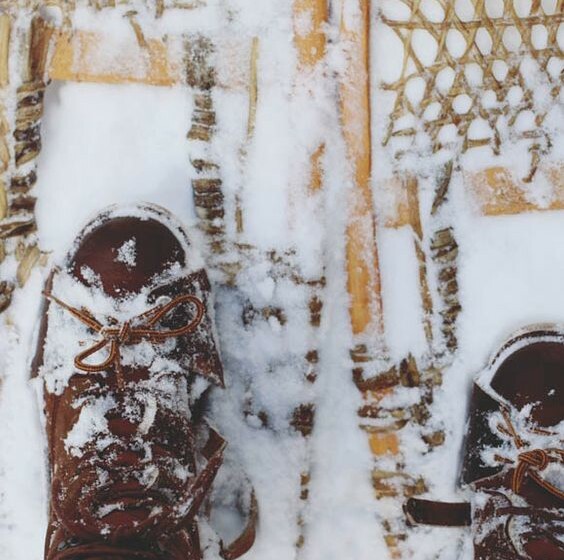 If your snowshoes go through ice in a modern binding, you're toast. Stick to the lost ways! Turning is the hard part. Stand in one place. Move and plant one foot at a time, turning your feet to turn your body. Backing up is a great way to fall. The back is heavy to make walking easy. Try to lift the entire shoe up. Then flex your foot to lift the tail. It is best to dress in layers if you are trying to keep warm in the winter. Layers provide better insulation, as well as the option of being able to take off layers if you get too warm. When you fall you will want to roll on your belly. Flop around until your shoes are under you. You might need to remove them and use them as a stepping stone. If you have a walking stick the process is easier. Speaking of walking sticks, you should use one. It will help you stand up. It will help you stay up. And it will let you whack your shoes when the snow builds up on top of them. Snow on your shoes is heavy and will tire you faster. When you reach safety, be sure to stand your shoes up by the fire to dry. The rawhide will tighten and reform itself from the day's stretching. Dry shoes won't fail you the next day. This nightly ritual will also allow you to check them for damage. 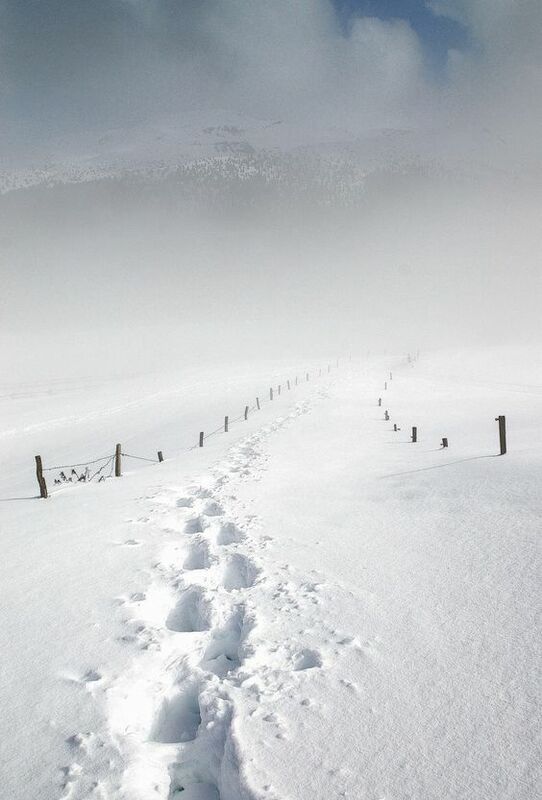 If your path includes the possibility of snow then you should have a set of snowshoes as part of your prep. You can buy your snowshoes, of course. You can also make a very nice pair of traditional shoes with some practice. The lost ways of building your own snowshoes can make trapping your own wild game for the perfect pemmican survival food much more rewarding. There is nothing in this world like traveling the woods like our forefathers did, totally reliant on the stuff you've made for you and your family. If life hands you lemons in the dead of winter, far from your preps and good snowshoes, you are still prepared. While not as ideal as good traditional shoes, these emergency snowshoes will get you out of the woods and to your safe place. 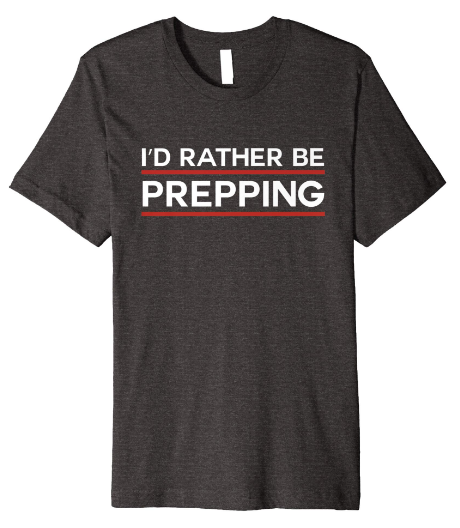 If you'd like to just purchase them, here's a good pair. You will need cord and a sharp knife. You will be cutting four long straight branches. Make sure they are green or at least fresh enough to flex without snapping. Pick ones that are about the same width. Remove any branch stubs. Cut two shorter branches that are about as thick as the first four. Arrange two long sticks and one shorter stick into a triangle. 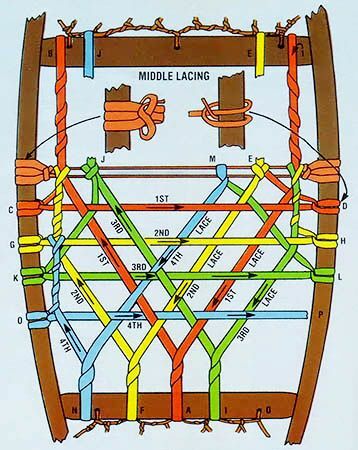 Knot them together securely. That's one frame. Make the other. You will need four more thin sturdy sticks. These will become your toe bar and heel bar. Tie your two bars to your frame. Leave space between them for your foot. Now tie some cord across your frame to make something to weave fir branches into. The wide part of the shoe is the front. Weave fresh fir twigs into your frame. Put the cut branch end in the front to reduce drag. Weave in branches until your snowshoes are filled. Next is the binding. Tie a loop around the toe bar that holds your shoe tightly. Now tie a long string to the middle of this loop at the center of the string. Place your foot in the toe loop. Wrap the ends of the string around your ankle. You tie them together on top with a bow knot. Now get out of Dodge. 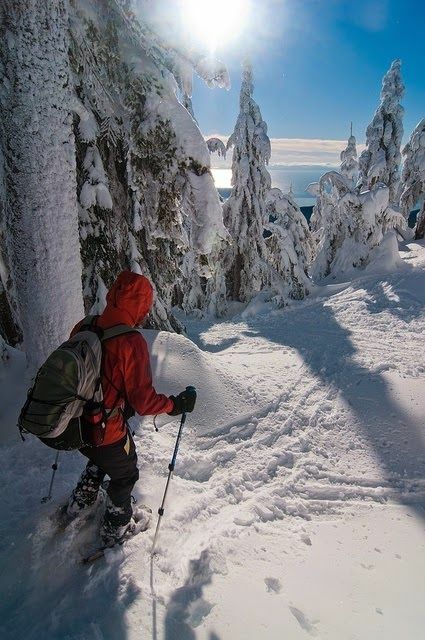 Whether it is saving your family's skin or simply trekking in this beautiful land, snowshoes make handling snow much easier. Who knew that getting back to our American roots could save your life? Other than you and I, of course! Let me know if you have any questions.